Apparently, I was setting a record, 45 minutes in the freezing cold Southern Indian Ocean. Normally 20 minutes in these waters is the maximum time in the cage. The cold water coupled with the inactivity of standing in the cage rapidly reduces the body’s temperature. The visibility was an appalling 1 meter, I was panicking as someone was paying me to be there and I couldn’t see anything let alone hope to get a decent shot. I maxed my time underwater. Ridiculously though, 5 minutes was wasted trying to get the GoPro onto the movie mode. For someone who now uses readers to see what’s cooking on the menu at any given restaurant, I haven’t a clue what I was thinking trying to flick through the GoPro menu only once I was underwater. 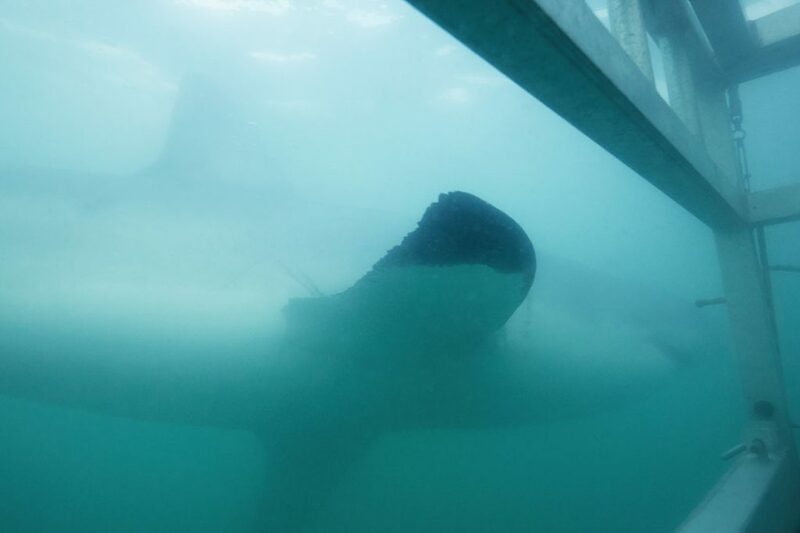 With no glasses, bits of chum floating past my mask and White Shark’s nudging the cage, I gave up. The main camera was handed down to me and I settled into the environment. 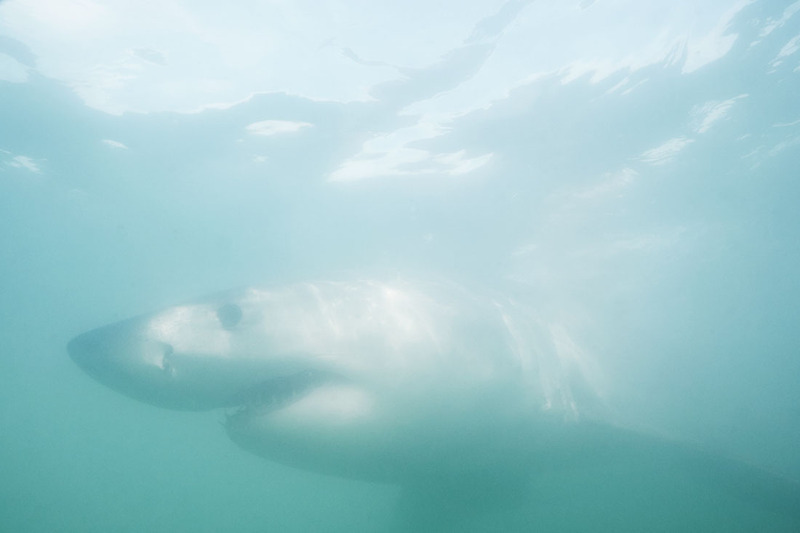 Unlike on previous occasions with good visibility, I didn’t have the luxury of time to frame the incoming sharks. They would appear ghostly from the murky water and when they were a few feet from me (the camera focus was locked at 2 feet) I pointed and shot. I can only imagine this is what being a tail gunner must have felt like when all hell was breaking loose during aerial combat. I wanted to put the camera down and enjoy the precious time with these magnificent animals as they glided past. It was hard to resist reaching out at the occasional pectoral fin as it sliced through the cage’s camera opening, wondering if they even felt my touch. Eventually, I was getting cold and my vision was starting to do that strange double take thing, body was there but head was definitely heading towards the exit. There was 150b of air left in my cylinder and it seemed a shame to waste, I thought a quick break topside and I’ll be good for round 2. I was speaking like somebody who had just devoured an entire 5L tub of ice cream when I climbed back onboard, I had no control of my mouth and could see on the designated dive master that I wasn’t making sense. A young lady half my age, I sensed she was a little embarrassed telling me I shouldn’t go back in as the initial stages of hypothermia were showing. When playing with nature one has to be content with what it serves on the day. That morning nature didn’t go my way, the ‘Storm of the Century’ had just passed the coast that kicked up the sea and ultimately affected the visibility. I was deeply disappointed and if at that moment I knew I was going to strike gold later that afternoon, from the topside, I wouldn’t have silently beat myself up so badly as I did standing on the back of the boat that morning shivering out of control.